Art Berman: Think Oil Is Getting Expensive? You Ain't Seen Nothing Yet. In the year that President Donald Trump pulled out of the Paris accord and downplayed global warming as a security threat, the US received a harsh reminder of the perils of the rise in the planet’s temperature: a destructive rash of hurricanes, fires and floods. According to Bloomberg, the US recorded 15 weather events costing $1 billion or more each through early October, one short of the record 16 in 2011, according to the federal government’s National Centers for Environmental Information in Asheville, North Carolina. And that tally doesn’t include the recent wildfires in southern California, one of which grew to be the largest fire in state history, according to Bloomberg. Among the most devastating events were hurricanes Harvey, Irma and Maria and wildfires in northern California. The killer storms caused economic losses of more than $210 billion in the U. S. and across the Caribbean, and about $100 billion in insured damages, according to Mark Bove, a senior research scientist with Munich Reinsurance America in Princeton, New Jersey. US oil exports boom as OPEC cuts production. There have been plenty of eye-catching stories in the energy industry this year, but one notable development has been the rise of the U. S. as a crude oil exporter. The ban on crude exports from the U. S. was lifted at the end of 2015, and exports ticked up in the following year, but only modestly. 2017, however, was the year that the floodgates opened. 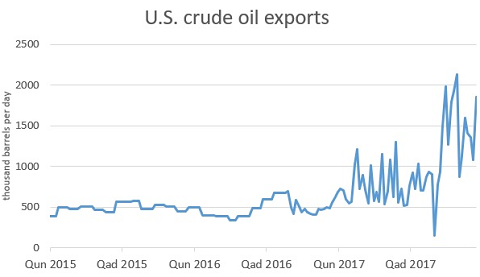 In the first half of the year, there were several weeks when the U. S. topped 1 million barrels per day (mb/d), but exports averaged about 750,000 bpd between January and June. 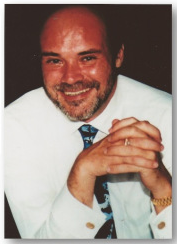 This post was published at Wolf Street by Nick Cunningham ‘ Dec 29, 2017. An official statement from Chinese officials tonight smacks of Obi Wan Kenobi – ‘these are not the secret oil trades you are looking for’. After being ‘caught RED HANDED’…according to South Korea’s Chosun Ilbo, U. S. recon satellites have photographed around 30 illegal transactions involving Chinese vessels selling oil to North Korea on the West Sea in October. The images allegedly showed large Chinese and North Korean ships transacting in oil in a part of the West Sea closer to China than South Korea. The satellite pictures even showed the names of the ships. President Trump took aim at President Xi this morning in a very clear tweeted warning that follows US spy satellite evidence that showed China allowing oil exports to North Korea. As a reminder, this is what President Trump is upset about, according to South Korea’s Chosun Ilbo, U. S. recon satellites have photographed around 30 illegal transactions involving Chinese vessels selling oil to North Korea on the West Sea in October. The images allegedly showed large Chinese and North Korean ships transacting in oil in a part of the West Sea closer to China than South Korea. The satellite pictures even showed the names of the ships. Venezuela has the largest proven oil reserve in the world. However, they are out of gasoline. The government has attributed this to poor management which has led to the stoppage of 80% of the country’s refineries. So much for socialism. The assumption that government is competent of managing anything is proven by this very example. This post was published at Armstrong Economics on Dec 28, 2017. European stocks are steady in post-Christmas trading if struggling for traction after a mixed session in Asia, amid trading thinned by a holiday-shortened week and ongoing worries about the tech sector; however a strong rally in commodities – including copper and oil – buoyed expectations for a strong 2018 and helped offset concerns over the technology sector triggered by reports of soft iPhone X demand. U. S. equity futures nudged higher while the dollar weakened against most G-10 peers as investors await the release of U. S. consumer-confidence data, with much of the spotlight falling on commodity currencies. The OZ dollar holds onto gains as copper surges to a three-year high; oil retreats after reaching the highest close in more than two years following a pipeline explosion in Libya on Tuesday. Treasuries and core European core bond yields are a touch lower. The Stoxx Europe 600 Index edged lower, with tech stocks hit for the third day amid rumors of weak iPhone demand and leading the decline as chipmakers slumped after analysts lowered iPhone X shipment projections, sending the Nasdaq Composite Index lower overnight. While mining and oil stocks strengthened due to a surge in copper prices to a 3.5 year high (see below), the European STOXX 600 index slipped 0.1% as European tech stocks tumbled on reports that demand for Apple’s iPhone X may be weaker than expected. The equity benchmark index is poised for an annual gain of 8.1%, the best advance in four years. Elsewhere, Volvo rose as China’s Geely bought Cevian’s stake in the truckmaker, making it Volvo AB’s largest stakeholder. IWG surged the most since 2009 after confirming it has received a a non-binding takeover offer from a consortium backed by Brookfield Asset Management and Onex. This post was published at Zero Hedge on Dec 27, 2017. Tell me again why we don’t toss our so-called “free trade” with China right here and now….. This post was published at Market-Ticker on 2017-12-27. While the U. S. Shale Energy Industry continues to borrow money to produce uneconomical oil and gas, there is another important phenomenon that is not understood by the analyst community. The critical factor overlooked by the media is the fact that the U. S. shale industry is swindling and stealing energy from other areas to stay alive. Let me explain. This post was published at SRSrocco Report on DECEMBER 26, 2017. According to South Korea’s Chosun Ilbo, U. S. recon satellites have photographed around 30 illegal transactions involving Chinese vessels selling oil to North Korea on the West Sea in October. The images allegedly showed large Chinese and North Korean ships transacting in oil in a part of the West Sea closer to China than South Korea. The satellite pictures even showed the names of the ships. China wants to dethrone the dollar and it could take a step in that direction before the end of the year. According to numerous reports, China is prepared to launch a yuan-denominated oil futures contract before Christmas. Last week, the Shanghai International Energy Exchange successfully completed a fifth round of yuan-backed oil futures testing. According to a report by RT, the organization has met all the listing requirements and is set for an official launch. Chinese trader Yuan Quwei told Bloomberg the holiday season would be the perfect time to get oil trading in yuan off the ground. This could be a nightmare before Christmas for the petrodollar. This post was published at Schiffgold on DECEMBER 19, 2017. Will Myanmar Embrace Market Reforms? The economic growth in Myanmar is now among the highest in Asia, and it’s come a long way since the 1960’s when it was considered one of the world’s most impoverished countries. It’s instructive to understand how this change took place, what some of the current economic metrics indicate, and current pressures being placed on Myanmar from the outside. For starters, the general history of Myanmar (also known as Burma, and the reason for the two names is interesting in itself) is long and fascinating. More recently, Myanmar was conquered by Great Britain (it was actually a part of British India, which was responsible for much of the administration) in 1855, and became relatively affluent in this part of the world, primarily due to the trade of rice and oil. However, even before British rule, Myanmar was already relatively well off due to its strategic location along important trade routes. Myanmar is located between India and China – Indian influence is still present, even today, and was resented, along with British control – and this trading activity helped offset a country based on self-sufficient agriculture and centralized control via a king. Britain ruled Myanmar until independence in 1948, when a series of nationalization and central planning efforts created a welfare state. The results were disastrous. Rice exports fell by two-thirds in the 1950’s, along with a 96% decline in mineral exports. In order to maintain central planning efforts, the government resorted to printing money, and runaway prices resulted from this inflation of the money supply. This post was published at Ludwig von Mises Institute on Dec 18, 2017.